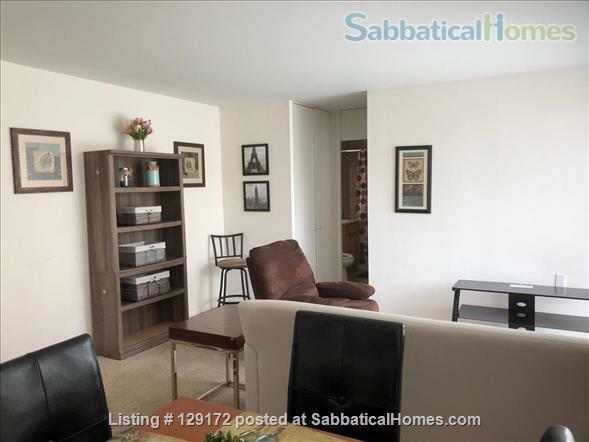 1 bed in Chicago's Gold Coast - close to everything! Furnished Unit available Jan 1st, 2020. We have different dates/units available throughout the year. Monthly rent dependent on length of stay/availability. Great location! A couple blocks away from the Newberry Library, Loyola and Northwestern, Lurie Children’s, Moody Bible! I have several furnished one bedrooms available as well, also a studio. 55 West Chestnut has lobby/receiving area, party room, Business Center. 24/7 exercise room. Package receiving. Doorman. We have a huge outdoor patio with BBQ's as well. The living room has a floor to ceiling bay windows. The view is facing north on the 23rd floor. You pay for electricity and cable. Chestnut is a nice quiet tree lined street, only blocks away from the beach, nightlife, restaurants, shopping (Michigan Ave) and more. Parking is available for an additional $200 a month. Electric and cable extra. There is free wifi. No dog policy. Cats allowed. Price may depend on length of stay.